In that time, we have experienced significant breakthroughs, including the legendary SUBARU BOXER engine. The equally famous Subaru symmetrical full-time AWD system. The recently introduced RWD system on the exhilarating BRZ sports coupe. The robust DC3 (Dynamic Chassis Control) system. And a rally-honed, fully independent suspension system. The horizontally opposed SUBARU BOXER boasts a low centre of gravity that creates balanced handling, flatter cornering and greater stability on every type of road. It’s also an inherently compact, smooth and responsive design that feeds power directly to the AWD and RWD symmetrical drivetrains with maximum efficiency. Subaru offers a wide range of these engines—4-cylinder and 6-cylinder, naturally aspirated and turbocharged—to suit a wide range of desires. The low centre of gravity improves stability in the corners, contributing to a more comfortable ride, crisper handling and great accident avoidance capabilities. This engine type is compact, lightweight and symmetrically positioned low in the chassis to create smoother and more direct power delivery. The horizontally opposed engine is relatively compact and has a low profile compared to similar displacement engines, so it’s able to slide underneath the cabin in a severe frontal collision. 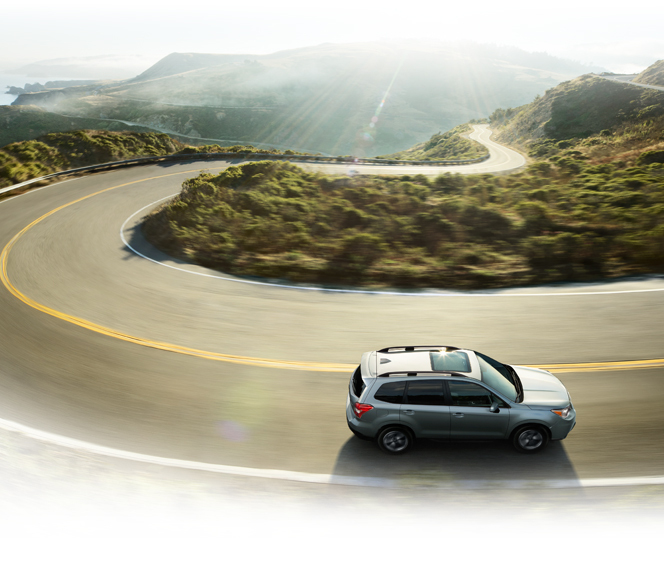 Transmissions + drivetrain Subaru offers 7 different models that showcase numerous unique transmission/drivetrain combinations that suit a variety of driving styles. These configurations include pairing the world-class Subaru symmetrical full-time AWD system with everything from a highly efficient Continuously Variable Transmission (CVT) to a racy 6-speed manual. Subaru also offers a rear-wheel drive configuration with a 6-speed short-throw manual or sporty 6-speed automatic on the exciting BRZ. The common denominator — the symmetrical nature of the drivetrain layout — ensures direct power delivery, optimum fuel efficiency and new standards of handling. 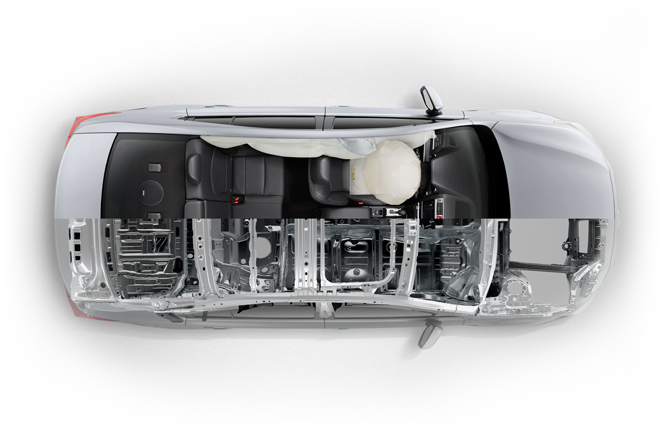 The Subaru Dynamic Chassis Control Concept (DC³) DC3 is engineered to balance the need for handling precision, occupant protection and sheer driving pleasure. This chassis design uses high-tensile steel for increased strength in critical areas and incorporates a rigid Cradle Mount front-end structure. The result: a super-strong chassis that allows the long-travel, 4-wheel independent suspension system the freedom to absorb every imperfection in the road, keep the wheels planted and deliver accurate steering feel the entire time. Every Subaru vehicle utilizes the MacPherson strut-type front suspension system, which is renowned for providing enhanced comfort, safety and handling prowess. The system is made even more robust through increased stiffness to reduce noise, vibration and harshness. Subaru vehicles also make the most of the suspension design by boasting a small turning circle for greater manoevrability, a wide track for superior stability and generous ground clearance to clear obstacles in the road. 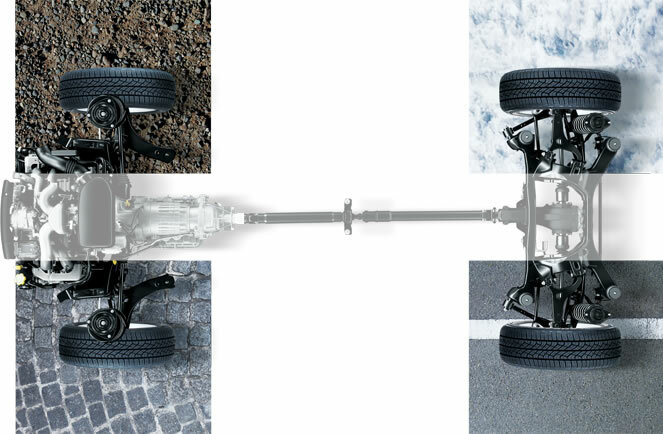 The double-wishbone rear suspension system has the capability to handle rough roads and sharp corners with equal composure. This design provides a more stable, planted feel because it offers more control over the degree to which the rear wheels tilt in and out in the corners. The double-wishbone is also flatter and more compact, so suspension components don’t intrude into the cargo area, increasing useable space for those more adventurous adventures. For a closer look at your favorite model, check under the hood.